Botswana has maintained one of the world's highest economic growth rates since independence in 1966. However, economic growth was negative in 2009, with the industrial sector shrinking by 30%, after the global crisis reduced demand for Botswana's diamonds. Although the economy recovered in 2010, GDP growth has again slowed. Through fiscal discipline and sound management, Botswana transformed itself from one of the poorest countries in the world to a middle-income country with a per capita GDP of $16,800 in 2012. Two major investment services rank Botswana as the best credit risk in Africa. Diamond mining has fueled much of the expansion and currently accounts for more than one-third of GDP, 70-80% of export earnings, and about one-third of the government's revenues. Botswana's heavy reliance on a single luxury export was a critical factor in the sharp economic contraction of 2009. Tourism, financial services, subsistence farming, and cattle raising are other key sectors. According to official government statistics, unemployment reached 17.8% in 2009, but unofficial estimates run much higher. The prevalence of HIV/AIDS is second highest in the world and threatens Botswana's impressive economic gains. An expected leveling off in diamond production within the next two decades overshadows long-term prospects. 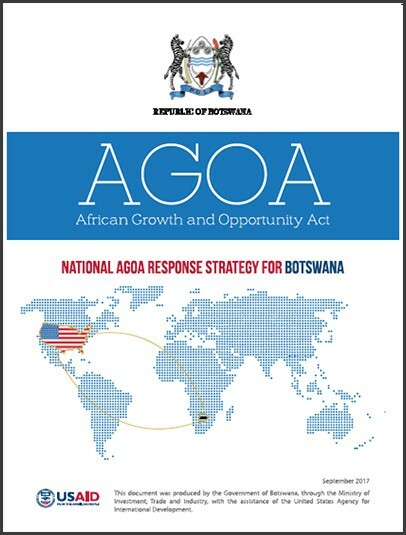 An overview of Botswana's participation and utilisation of AGOA preferences since 2000, including relevant trade data and sector-focus. Double-sided A4 brochure. For printing, set 'fit to page'. This document was prepared following a multiple stakeholder consultation process facilitated by the Botswana Ministry of Investment, Trade and Industry with assistance from the USAID Southern Africa Trade and Investment Hub. The author’s views expressed in this publication do not necessarily reflect the views of the United States Agency for International Development or the United States Government.